New snow is falling, drifting quietly on this, the last day of a tumultuous year. The New Year is now only hours away--minutes away in Tokyo. New hopes take shape in the hearts and minds of so many. On this day, we pause, we reflect and we celebrate. Happy New Year, Mamas! May it bring you much love, laughter and abundant joy. Happy new year, Meaghan! 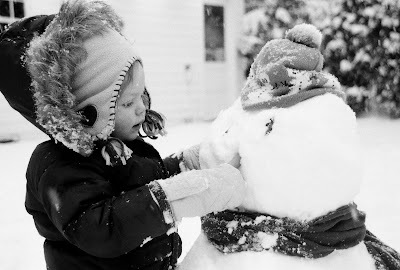 That is a beautiful pic of a beautiful child (cute snowman, too). And to you and your too! Happy New Year to you and your little one!